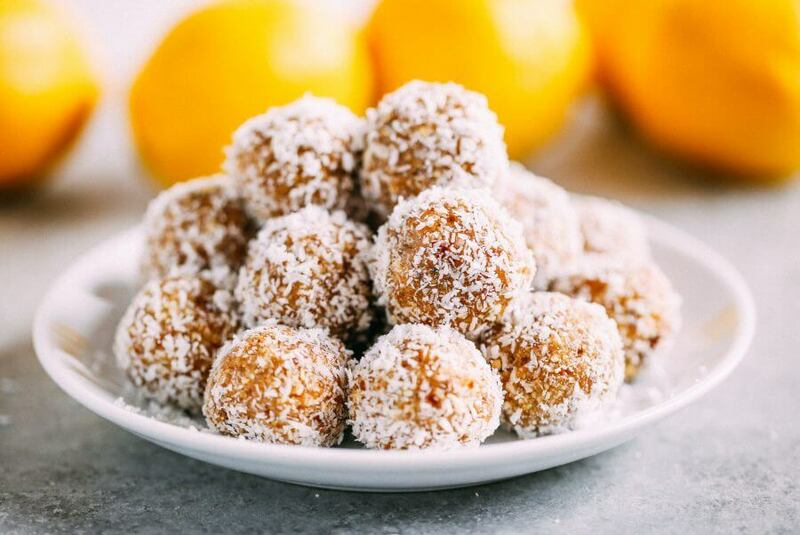 Raw lemon larabar bites are an easy snack to make for meal prep and on the go! These paleo snacks taste like lemon pie and are made with just a few healthy ingredients. Gluten free and allergen friendly. 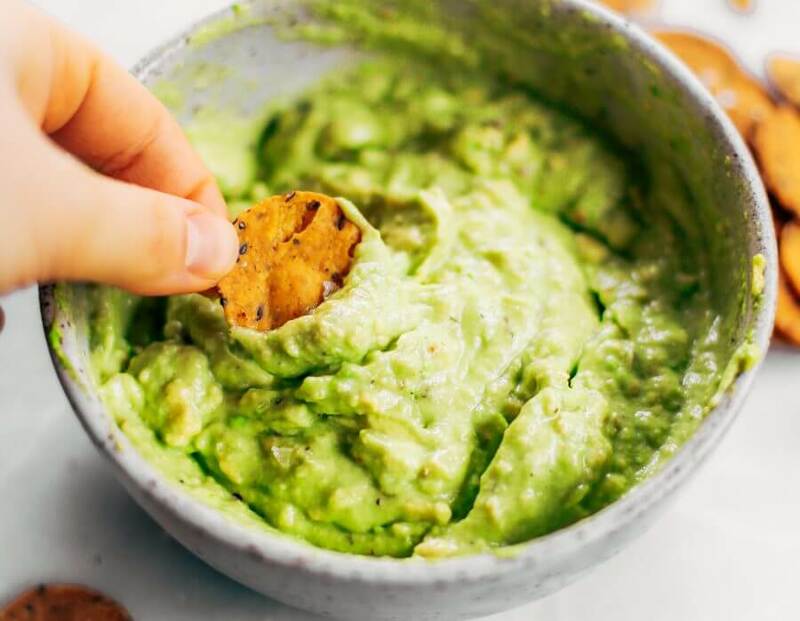 In a food processor combine all ingredients (except shredded coconut) and blend until it reaches a course consistency, but still sticks together when pressed between your fingers. Use a small ice-cream scoop and form about 22 balls (roll the dough between the palms of your hands to create a smooth and even ball). Then roll in finely shredded coconut to coat the outside. Serve or store in fridge or freezer. Nutrition Facts Raw Lemon Larabar Bites Amount Per Serving Calories 90 Calories from Fat 27 % Daily Value* Total Fat 3g 5% Saturated Fat 1g 5% Polyunsaturated Fat 1g Monounsaturated Fat 1g Sodium 47mg 2% Potassium 73mg 2% Total Carbohydrates 15g 5% Dietary Fiber 1g 4% Sugars 11g Protein 2g 4% Vitamin C 0.1% Calcium 1% Iron 4% * Percent Daily Values are based on a 2000 calorie diet. Vanilla banana soft serve. Vegan “nice” cream recipe. Only need three ingredients to make this amazingly creamy ice-cream treat! A perfect vegan dessert- feel free to stir in any of your favorite toppings! In a high powered blender combine all ingredients and puree until completely smooth. Eat right away or stir in favorite toppings and freeze for later. Nutrition Facts "Nice" Cream Soft Serve Amount Per Serving Calories 128 % Daily Value* Cholesterol NaNmg 0% Potassium 450mg 13% Total Carbohydrates 29g 10% Dietary Fiber 3g 12% Sugars NaNg Protein 6g 12% Vitamin C NaN% Iron 2% * Percent Daily Values are based on a 2000 calorie diet. Easy homemade fudge recipe, made with just two ingredients! 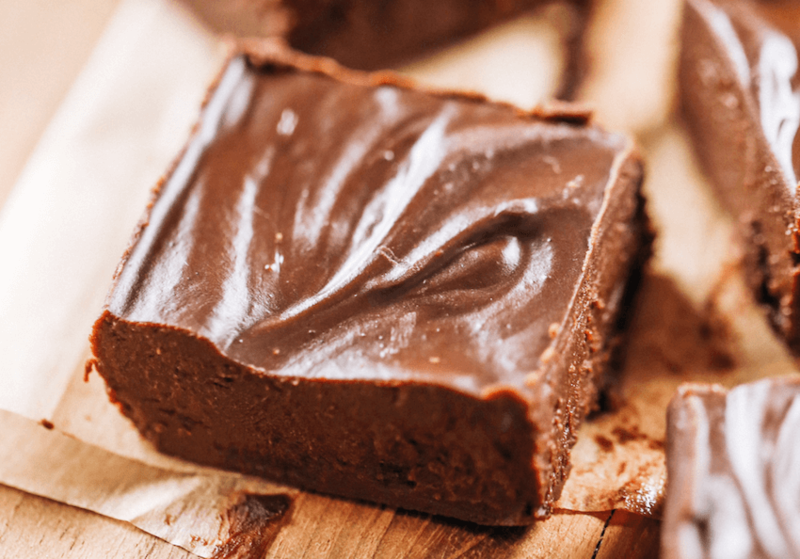 Melt in your mouth paleo fudge recipe anyone can make at home in their kitchen. Perfect freezer-friendly healthier candy option to have on hand. 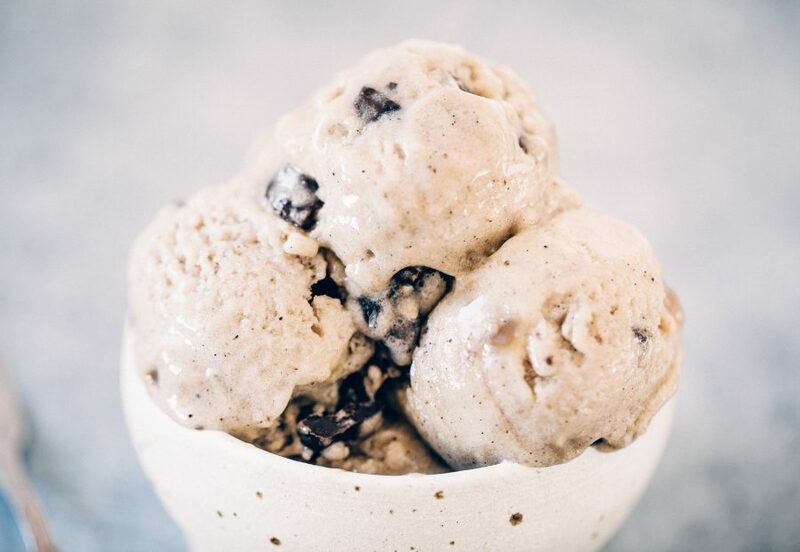 In a saucepan or double boiler, heat coconut milk until hot, but not boiling, then remove from heat and add chocolate chips and set for 30 seconds until melted. Stir until the mixture is completely smooth, then pour into a 4" by 8" pan lined with parchment paper and cool in the freezer until solid (about 1 hour). Slice into about 1" squares and serve or store in freezer. Nutrition Facts Homemade Fudge Amount Per Serving Calories 109 Calories from Fat 63 % Daily Value* Total Fat 7g 11% Saturated Fat 5g 25% Sodium 2mg 0% Total Carbohydrates 14g 5% Dietary Fiber 1g 4% Sugars 9g Protein 1g 2% Iron 8% * Percent Daily Values are based on a 2000 calorie diet. Nutrition Facts 2 Minute Dairy Free Yogurt Recipe Amount Per Serving Calories 344 Calories from Fat 225 % Daily Value* Total Fat 25g 38% Saturated Fat 4g 20% Polyunsaturated Fat 4g Monounsaturated Fat 15g Sodium 14mg 1% Total Carbohydrates 17g 6% Dietary Fiber 2g 8% Sugars 4g Protein 12g 24% Calcium 4% Iron 21% * Percent Daily Values are based on a 2000 calorie diet. Creamy lemon garlic dressing is both whole30 and paleo. 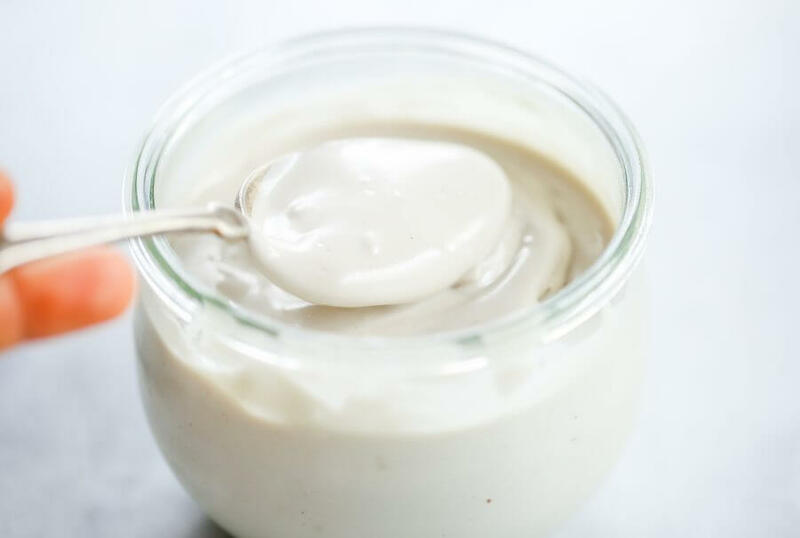 This easy dairy free salad dressing tastes like ranch dressing and is made with coconut milk! A healthy oil-free paleo dressing recipe. In a food processor combine all ingredients until smooth, then serve or store in fridge for 4-5 days. 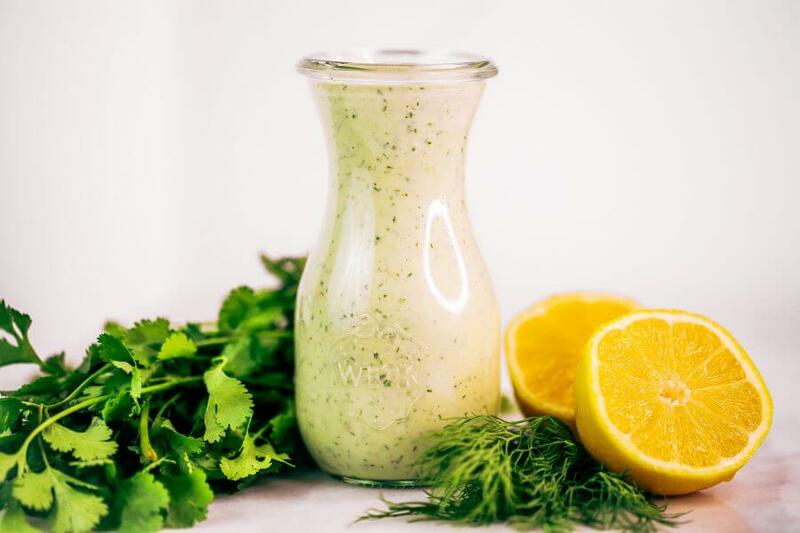 Nutrition Facts Creamy Lemon Garlic Dressing (Whole30, Paleo) Amount Per Serving Calories 482 Calories from Fat 387 % Daily Value* Total Fat 43g 66% Saturated Fat 36g 180% Polyunsaturated Fat 0.2g Monounsaturated Fat 1g Sodium 2039mg 85% Potassium 866mg 25% Total Carbohydrates 24g 8% Dietary Fiber 4g 16% Sugars 5g Protein 7g 14% Vitamin A 185% Vitamin C 257% Calcium 14% Iron 44% * Percent Daily Values are based on a 2000 calorie diet. Best homemade keto chocolate chip cookies! Soft and thick sugar-free paleo cookie recipe; packed with protein and made with almond flour. This healthy chocolate chip cookie recipe is a perfect keto snack! 1/2 cup almond butter or peanut butter for more flavor! In a bowl combine all ingredients (except chocolate chips) until smooth, then stir in chocolate chips by hand. Use a medium sided ice-cream scoop and set cookies on a large baking tray (makes about 20). Bake on 350F for 20 minutes, then allow to cool before serving, so they can "set" and firm up. 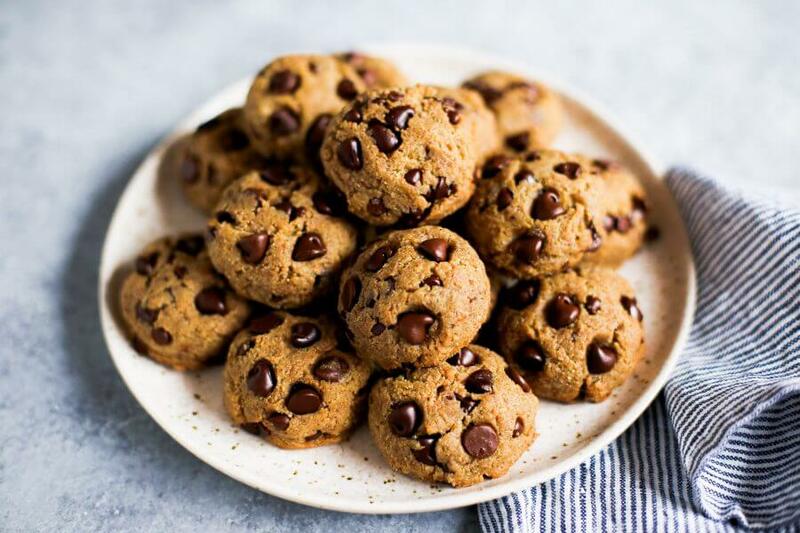 Nutrition Facts Keto Chocolate Chip Cookies Amount Per Serving Calories 187 Calories from Fat 144 % Daily Value* Total Fat 16g 25% Saturated Fat 1g 5% Polyunsaturated Fat 0.1g Monounsaturated Fat 0.2g Cholesterol 19mg 6% Sodium 116mg 5% Potassium 6mg 0% Total Carbohydrates 7g 2% Dietary Fiber 4g 16% Sugars 1g Protein 7g 14% Vitamin A 0.4% Calcium 9% Iron 7% * Percent Daily Values are based on a 2000 calorie diet. Paleo blueberry muffins made with sweet potatoes instead of flour! 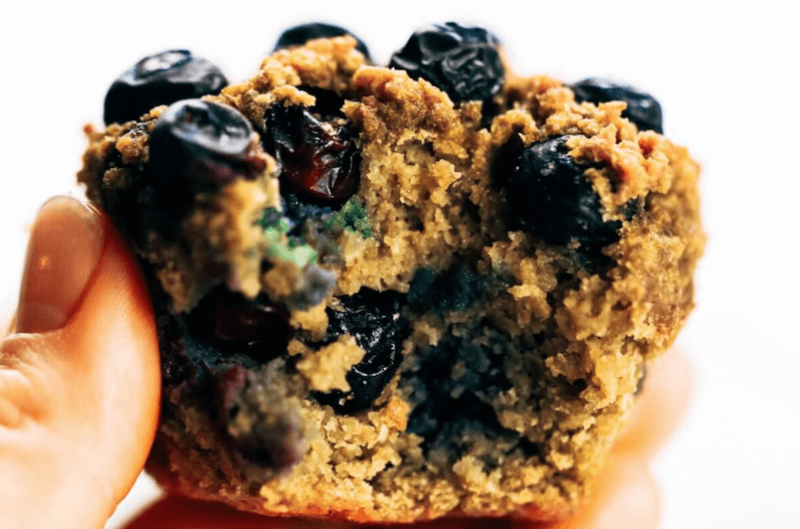 These flourless muffins make for a healthy breakfast on-the-go! Kid-proof and delicious paleo breakfast recipe for meal prep. Preheat oven to 350F. Line a muffin pan with paper liners or grease with coconut oil. Chop sweet potato into 1/2" rounds. In a food processor blend sweet potato chunks until minced. Add rest of ingredients to the food processor (except blueberries) and blend until smooth, then stir in blueberries by hand- you can reserve half the blueberries to sprinkle on top before baking, if you like. Use a large ice-cream scoop to fill the muffin pan with batter. Bake on 350F for 50 minutes until golden. You will know when they are done when a clean knife or toothpick inserted into the center of a muffin comes out clean. Nutrition Facts Sweet Potato Blueberry Muffins Amount Per Serving Calories 227 Calories from Fat 90 % Daily Value* Total Fat 10g 15% Saturated Fat 6g 30% Polyunsaturated Fat 0.2g Monounsaturated Fat 1g Cholesterol 62mg 21% Sodium 195mg 8% Potassium 20mg 1% Total Carbohydrates 31g 10% Dietary Fiber 6g 24% Sugars 17g Protein 5g 10% Vitamin A 98% Vitamin C 6% Calcium 9% Iron 5% * Percent Daily Values are based on a 2000 calorie diet. Whole30 ranch dressing made with avocados instead of oil! Easy five minute ranch dressing. This dairy free ranch dressing can be used as a salad dressing, veggie dip, or spread for sandwiches and burgers. In a food processor, puree ingredients until smooth. 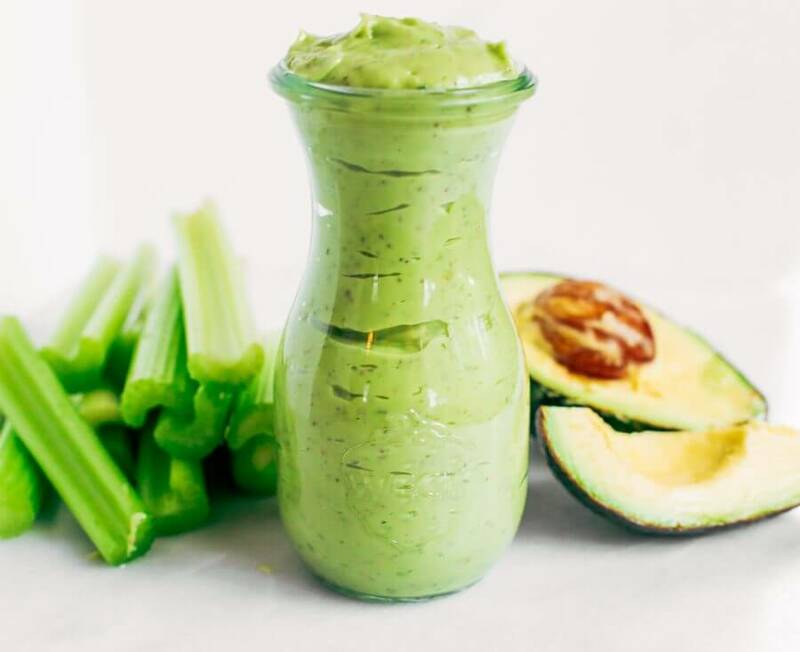 Nutrition Facts 5 Minute Avocado Ranch Dressing Amount Per Serving Calories 847 Calories from Fat 630 % Daily Value* Total Fat 70g 108% Saturated Fat 24g 120% Polyunsaturated Fat 7g Monounsaturated Fat 31g Sodium 68mg 3% Potassium 2539mg 73% Total Carbohydrates 65g 22% Dietary Fiber 34g 136% Sugars 4g Protein 7g 14% Vitamin A 122% Vitamin C 204% Calcium 72% Iron 103% * Percent Daily Values are based on a 2000 calorie diet. 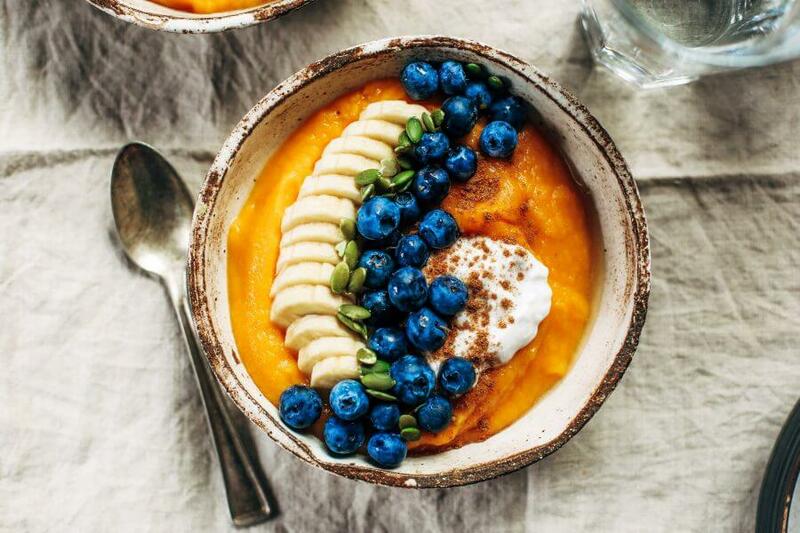 Paleo breakfast bowl made with butternut squash. Topped off with blueberries, bananas, and pumpkin seeds. This healthy breakfast is easy for on-the-go lifestyles and busy families. Plus, it tastes amazing and will leave you wanting more! How to bake butternut squash: Preheat oven to 400F. Cut squash in half lengthwise and set facedown on a baking tray with 1/2" water. Bake on 400F until when poked with a fork is soft, but not mushy (about 40-60 minutes, depending on the size of your squash). In a food processor blend ingredients for base until smooth. Transfer to bowls and add toppings before serving. Squash can be stored in fridge throughout the week for easy meal prep! Nutrition Facts Paleo Butternut Squash Breakfast Bowl Amount Per Serving Calories 337 Calories from Fat 171 % Daily Value* Total Fat 19g 29% Saturated Fat 4g 20% Polyunsaturated Fat 3g Monounsaturated Fat 2g Sodium 4mg 0% Potassium 213mg 6% Total Carbohydrates 35g 12% Dietary Fiber 6g 24% Sugars 14g Protein 10g 20% Vitamin A 92% Vitamin C 19% Calcium 5% Iron 15% * Percent Daily Values are based on a 2000 calorie diet.